Discover the Best of Provence with a tour package for three days with a tour based in Avignon. Your Best of Provence tour will begin with a pickup at the Avignon TGV station when your train arrives from Paris. Please note that train tickets are not included in prices listed below, but we are happy to help you secure the tickets prior to your departure for Europe. Arrival and departure transfers from the train, and tour transportation. 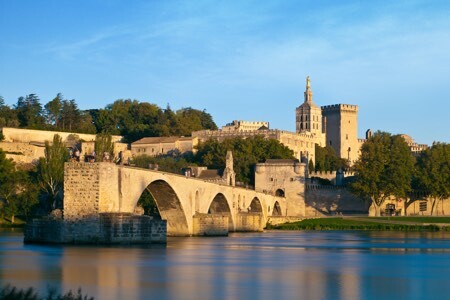 Day One: Tour begins with transfer from your train’s arrival in Avignon to your Avignon hotel. In the afternoon, you will be able to visit Avignon on your own with tickets for the Popes’ Palace and Pont d’Avignon with a “HistoPad”. Your audioguides will enrich the visits. Drive to Fontaine de Vaucluse: walk up to the cave from which the River Sorgues emerges. This impressive resurgence spring hasn’t revealed its secrets yet and many speleologists have searched in vain to determine the exact depth of the well. Continue to the Point du Gard (entrance fees included) to visit the best preserved aqueduct of the Roman period, dating back to the 1st century and listed by UNESCO. Photo stop at the Antiques in Saint Rémy de Provence (Triumphal Arch and mausoleum) located in an olive-tree field. Day Three: You will be picked up at your hotel for a morning shared tour. You will visit Orange to have a panoramic tour of the city with its Roman monuments, Triumphal Arch, and Antique Theater (entrance ticket and audioguide included). The theater is one of the best preserved theaters from the Roman period. Next, you’re off to the Châteauneuf du Pape for a scenic drive and sightseeing in the vineyards followed by a wine-tasting in a cellar. You’ll have a great introduction to the wines of the Rhône Valley. During the tour, you will get explanations “terroir”, grape varieties, vilification, and aging cellars. Your Best of Provence tour package will end with a transfer to the Avignon TGV station in the afternoon.